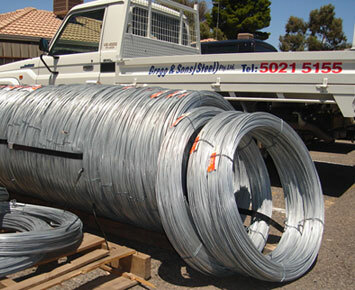 Gregg & Sons Steel Pty Ltd is a family run business, dedicated to offering top notch service and competitive prices. Situated at 2-8 Grace Cresent Buronga, just across the river from Mildura, we are stockists of all things steel, and will cut steel to size and deliver it to your door. Gregg & Sons Steel Pty Ltd was founded in 1986 by Brian and Sandra Gregg who over the following 10 years, established a terrific business supplying the builders, blockies, graziers and the general public of the greater Sunraysia area with a level of customer service that couldn't be beaten. In April 1996 Greggs Steel (as it was previously known) was purchased by the A.N.I. Corporation. In 2005, Brian was then requested to return to establish a Metal Corp branch for Sunraysia to offer the same high quality service that he was known for. In August 2008 Brian, Sandra and their two sons, Leon and Evan, established this new business which embraces the same attitudes of service and competition that was present in their previous Steel business. Our new premises at 2-8 Grace Cresent has serviced Gregg & Sons (Steel) Pty Ltd well in the past 2 years. We would like to thank all of our loyal customers for all your on-going support and wish you all well in the new year. For weekly specials, see Sunraysia Daily, Mildura Mid Week and Mildura Weekly news papers.